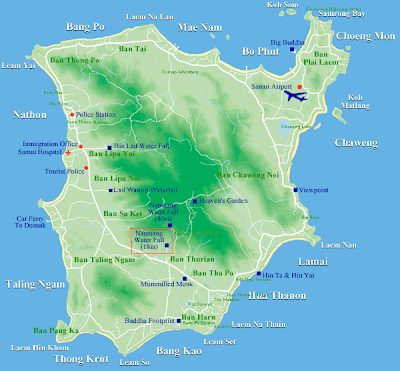 This blog gives you the information how to travel from Nakhonsithammarat Airport to Koh Samui like local people do. 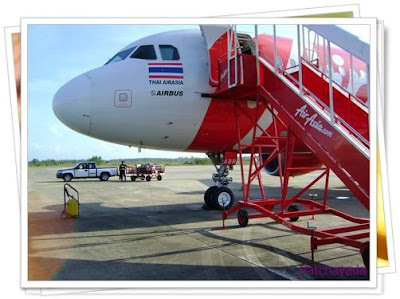 When you arrive at Naknonsithammarat Airport by Air Asia , Thai Lion Air or Nok Air, after you collect the baggage, you have to walk until the exit of the airport and you will see the limousine counter service that can take you to any places in the town or nearby area. To go to Nakhonsithammarat Town, the join car will cost 100 Baht per person, but you have to wait until it is full then they will go. 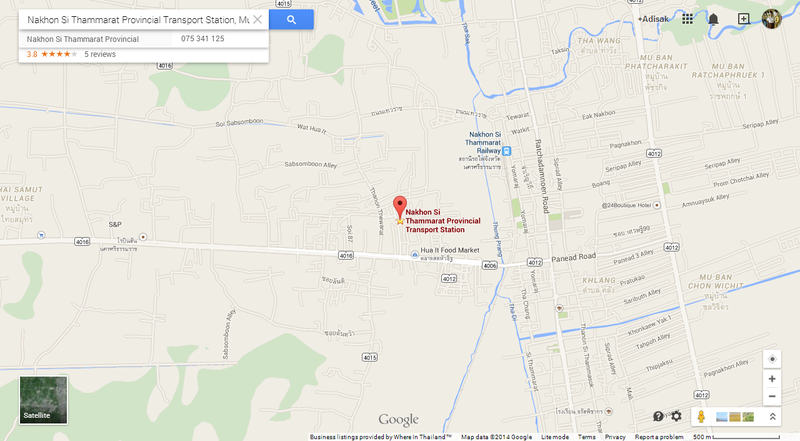 If you charter a car it will cost 300 Baht per car to Nakhonsithammarat Town. 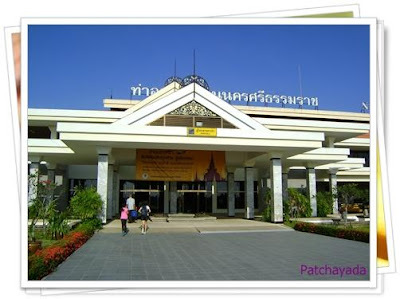 It takes about 15-20 minutes from Nakhonsithammarat Airport to the town. 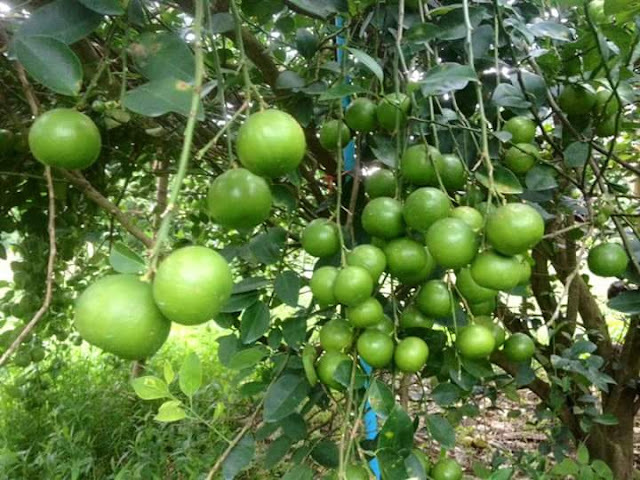 Or if you don't want to charter any car or van, but just want to travel or be transferred like local people in Nakhonsithammarat, just read the next topic. 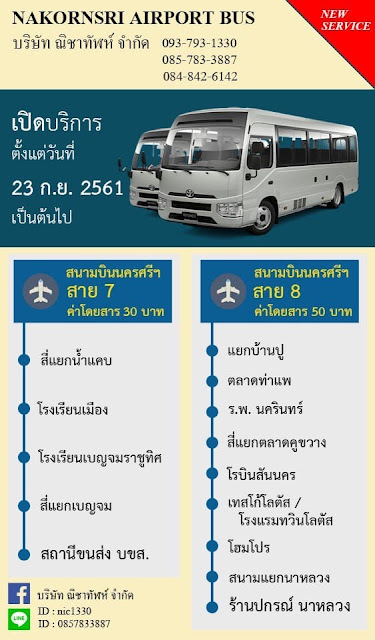 Another line is Number 8 : From Nakhonsithammarat Airport, driving pass Tha Pae Market, Om Kai Road(ถนนอ้อมค่าย), Pattanakarn Ku Khwang Road (ถนนพัฒนาการคูขวาง), Naluang junction(แยกนาหลวง), and Last stop at Huathanon Junction(สี่แยกหัวถนน), the fare price is 50 Baht per person all along the way , take about 50 minutes to Huathanon Junction. 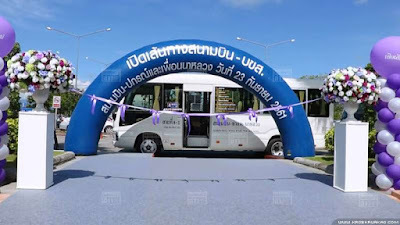 Picture Showing the name of the bus company Nakhonsri Airport Bus starts service from 23rd September 2018 onward. Service daily during all flights time. And the contact numbers are shown on the picture too. This review is a part of the blog review in Thai language and we just translate to be English. 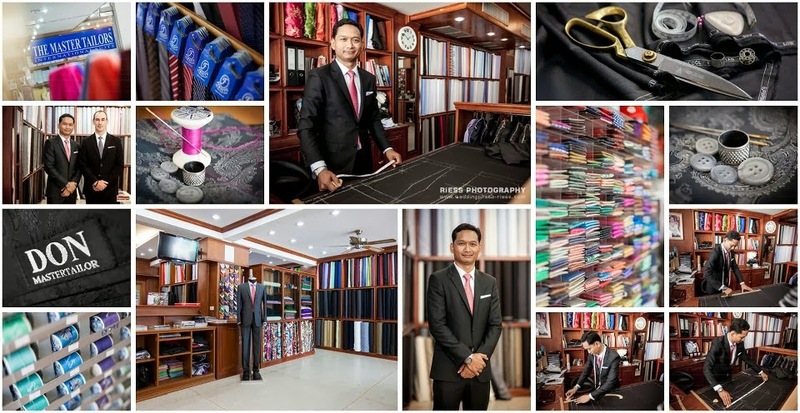 Thank you very much for Khun Patchayada for the pictures and information. 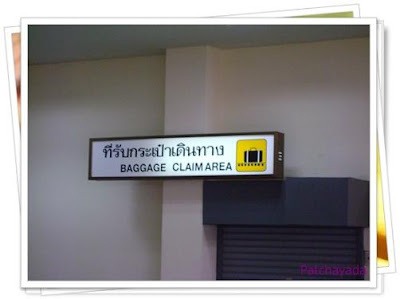 Then we have to wait for our baggage in the Baggage Claim Area inside the arrival terminal. This is the receipt of the join transfer from Nakhonsithammarat airport to the town, 100 Baht per person. 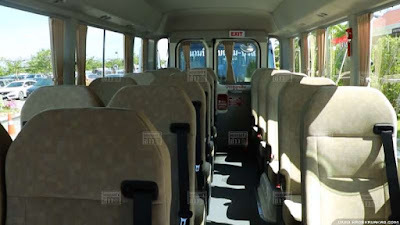 If you want to charter the car from Nakhonsithammarat airport to Donsak ferry pier, the price is 1500 Baht per car , maximum can be 4 people but not with big baggage because there is not much space for the baggage) If you want to charter the van it will cost you 2500 Baht per wan, maximum not more than 8 people with the baggage. The car from Nakhonsithammarat will take about 20 minutes to Nakhonsithammarat town. 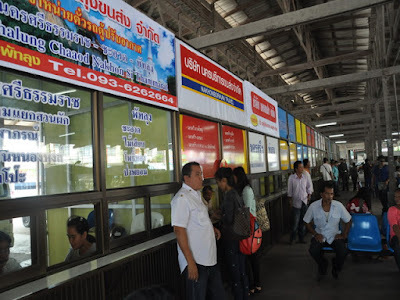 The charter car from Nakhonsithammarat airport to Donsak ferry pier will take about one and half hour. Beside the bus also write in English to the places that it will drive pass. 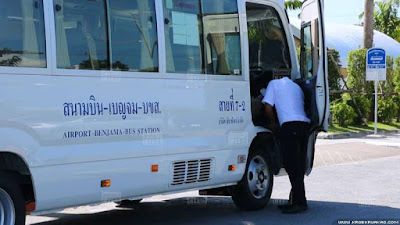 Please note that now the van company that takes passengers from Nakhonsithammarat to Donsak Pier Suratthani (to get the ferry to Koh Samui) does not start at Talad Yen fish market anymore. 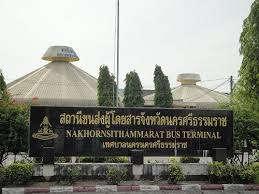 They changed the place to be "Nakhonsithammarat Provincial Transport Station" or local people call it "Hua - It Bus Terminal" in the town of Nakhonsithammarat. 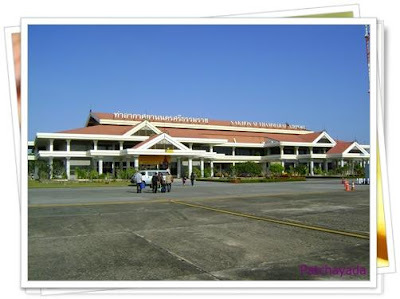 It takes about 20 minutes from Nakhonsithammarat Airport to Hua - It Bus Station.You can see the google map at the link below. The van will drop you here. Then you have to walk along this way to get on the ferry. Then you have to walk from the pier along the walk way again to this building (about 100 meters long) or somtimes Seatran Ferry company has the pick-up truck form the pier to this building for free. "Song Taew" (Song = 2 , Taew = row : 2 rows because in Song Taew has 2 rows of the seat) will stand by for the passenger every time of the ferry. 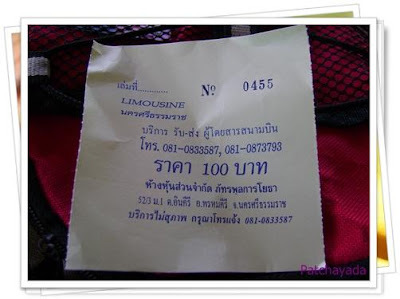 From Koh Samui , if you have to travel to Nakhonsithammarat Airport, you can travel by Lompryah company transfer service. The ticket is 600 Baht per person per way. 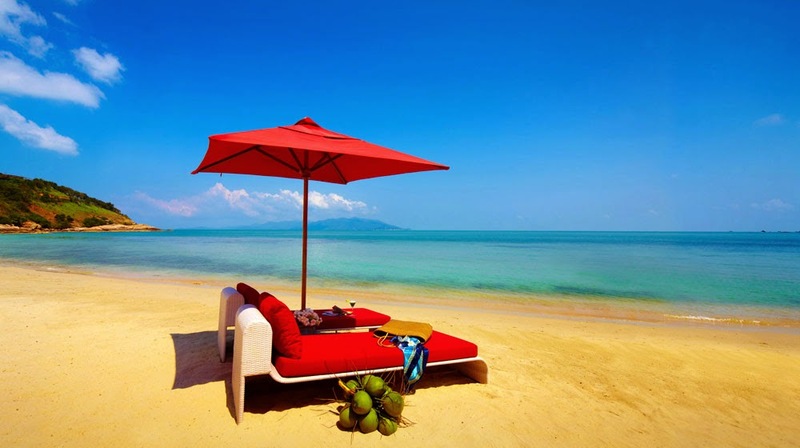 If you need a pick-up service from the hotel in Koh Samui to the pier, it will be 150 Baht more per person = 150 + 600 = 750 Baht totally, then you will arrive to Nakhonsithammarat Airport. 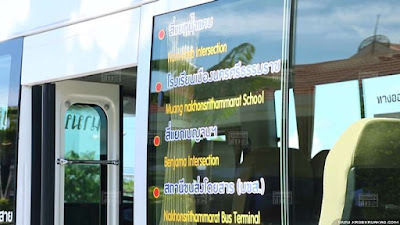 This transfer departure from Samui at Nathon Pier at 8:00 a.m. and 12:45 Hrs by Lomprayah Catamaran to Donsak pier, then they will have the join company buses transfer to Nakhonsithammarat Airport. 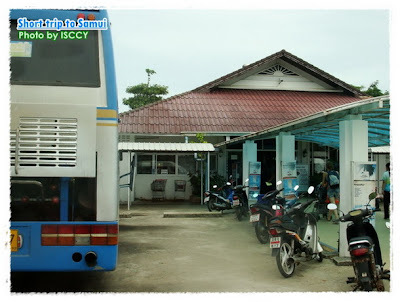 This red-roof building is the place where you can buy Lomprayah Ticket to go to the mainland at Donsak pier boat time at 8:00 a.m. and 12:45 Hrs. daily. After you buy the ticket, you have to walk until the end of this bridge to the tent and wait for the catamaran. (Sometimes Lomprayah company will have the pick-up transfer for free to the end of this pier but you have to wait for it. If you don't want to wait, just walk, it is only 100 meters long. 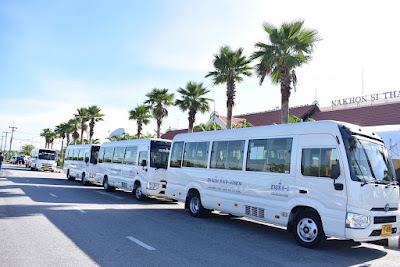 If you are the big group of people and need the private transfer from Koh Samui hotel to Nakhonsithammarat Airport or Suratthani Airport , www.samuibackpack.com can provide you the price of 4500 Baht per van included the transfer in Koh Samui from your hotel to Nathon pier and transfer on the mainland to Nakhonsithammarat or Suratthani Airport and the ferry ticket for the van and the driver. (But not included the ferry ticket for passengers. 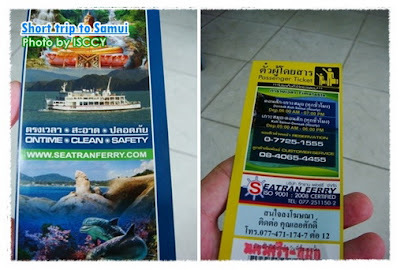 (You have to pay extra about 130 Baht per person for the ferry ticket.) Just call us to Tel : 083 1430034 as lease 1-2 days in advance to provide the van for you. 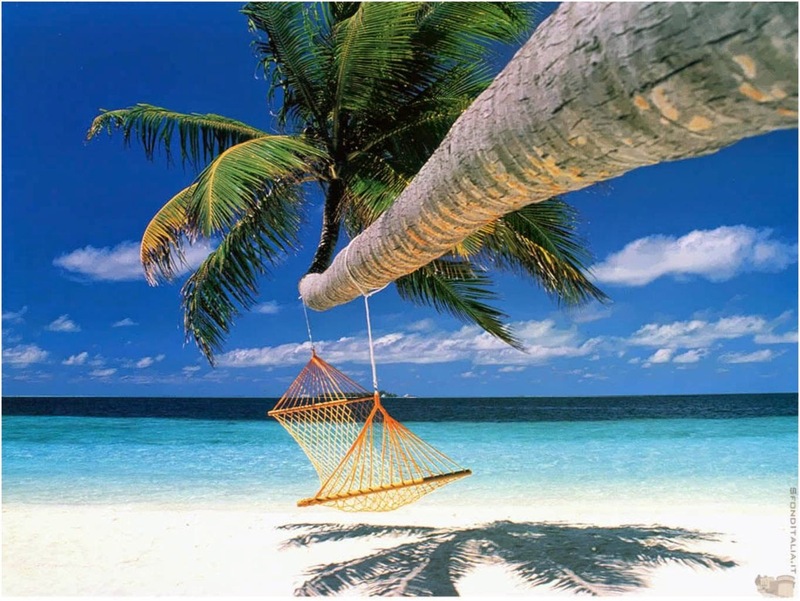 When you come to Koh Samui Thailand, you should not miss all activities in this link. 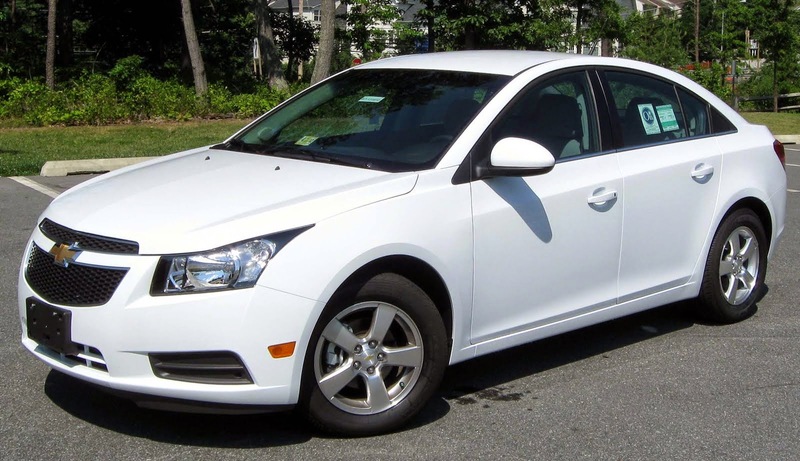 Very cheap price private car take you to visit the Big Buddha Temple, View Point, Kunaram Temple to see the mummified Monk, Namuang Waterfall No.1, Nathon Town. The trip will take about 4 hours. 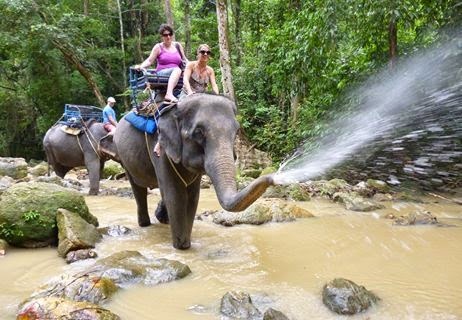 A short trip just 3 Hours, Elephant trekking for 1/2 Hr, visit waterfall No.1 then visit the mummified Monk name Luang Pho Daeng at Kunaram Temple, See monkey at working of coconut collecting, Sila Ngu Temple before head back to the hotel. The trip has 2 times a day : morning and afternoon trip. 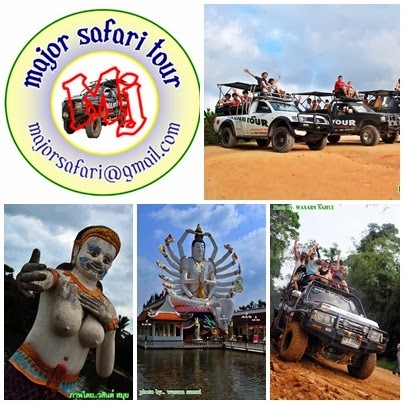 4 X 4 0ff road pick you up to see the Granfather & Grandmother Rock, Hua Thanon Market, Kayaking in the canal, visit mahout village, swim at Namuang Waterfall No.2, Have lunch, Elephant Trekking, Baby elephant bahting show, Big elephants show, Monkey show, Cooking Thai Food show is the last activity in this trip. 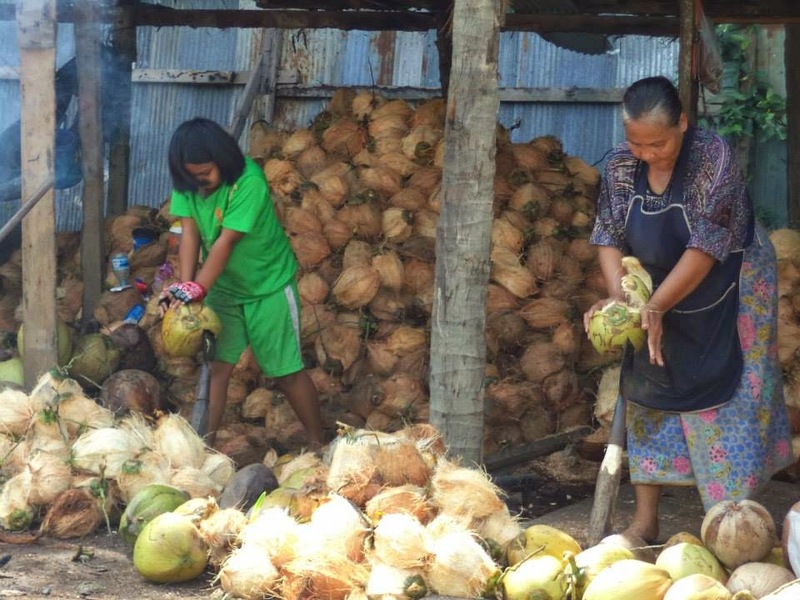 .Kota Kinabalu & Sandakan Trip. Добро пожаловать всем на острове Самуи.